We are pleased to invite you to view the live-stream IMLS-funded Blockchain National Forum recordings from the event held in San Jose, CA on Monday, August 6. The format for this live-streamed event included panel presentations and discussions from notable experts in the information professions, business, government, and urban planning. They focused on suggested blockchain applications that might be employed by libraries and archives. The day’s proceedings were live-streamed and participants had the opportunity to submit questions and comments. You may view the recorded sessions here. The Blockchain National Forum will be live-streamed and recorded. Please feel free to distribute this link widely so others may participate in the discussions. 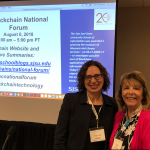 The goal of this forum sponsored the SJSU School of Information and a grant from IMLS was to discuss and make recommendations about the future uses of blockchain technology within the information professions. The results of the forum are the basis for a White Paper that will be submitted to IMLS and distributed to the information communities. In preparation for the National Forum the participants prepared Executive Summaries on possible blockchain applications and considerations for the information professions.